The Toyota Camry sedan was all-new for the 2018 model year, finally raising the bar from “Ho-Hum” to “Wow” with its emotionally charged design and improved driving dynamics. The Camry has been the best selling car in America for the past 16 years. The exterior styling reflects Lexus-like cues with bold athletic exterior character lines and a ground-hugging stance. 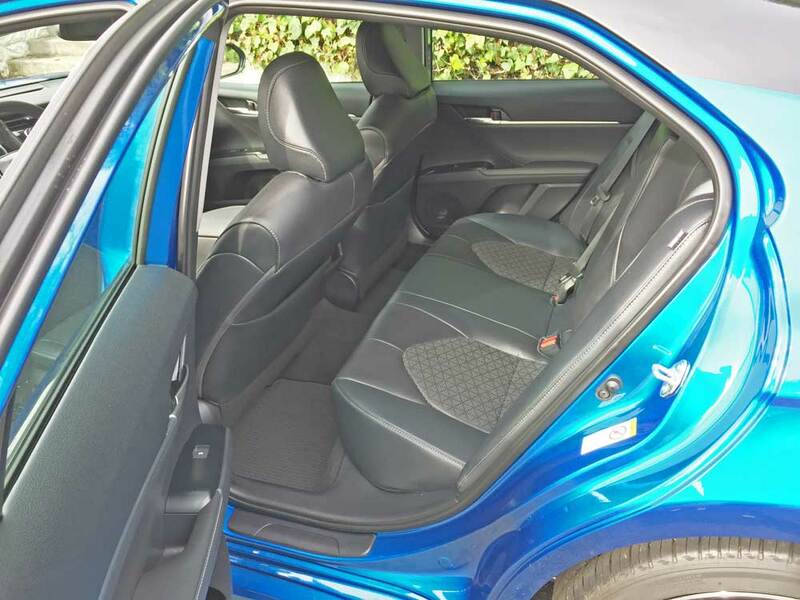 The interior is s more sumptuous and provides enhanced space, while featuring an advanced driver focus. The Camry has been Toyota’s flagship since its introduction in 1982, and it comes in four distinct levels of trim: the base LE, SE, XSE, and top-of-the-line XLE. 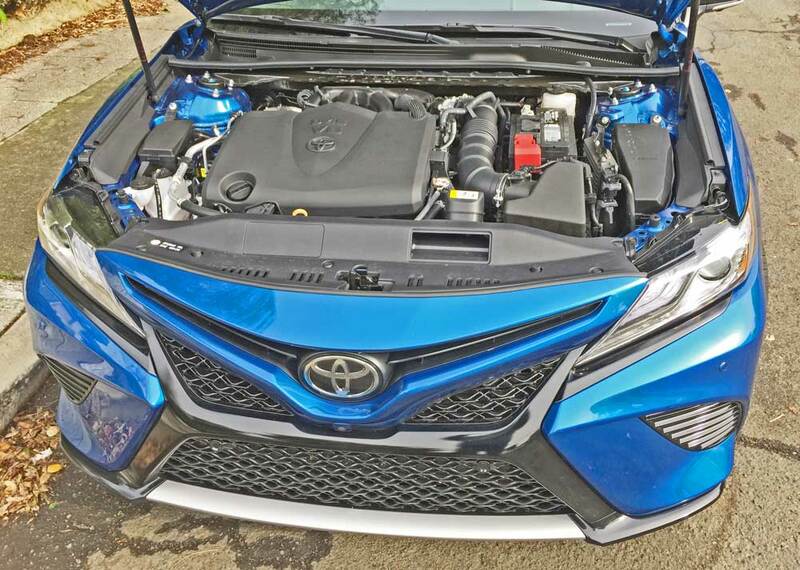 The Hybrid Camry comes only in LE, SE and XLE trim grades. All are four-door, five-passenger sedans and all come standard with Toyota’s Safety Sense Package. 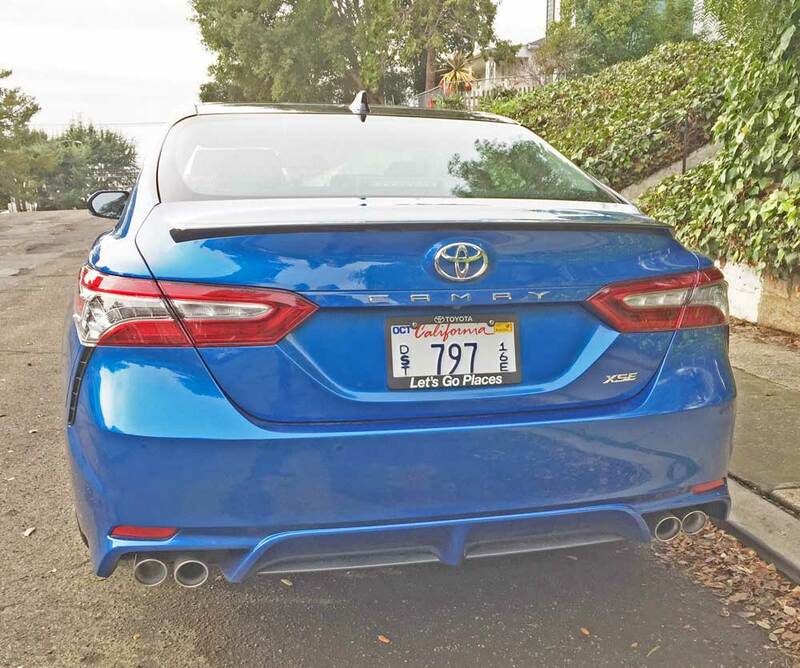 My test vehicle was a 2019 Toyota Camry in XSE trim with the 301 horsepower V-6 and Direct Shift eight-speed automatic transmission with sequential shift mode. 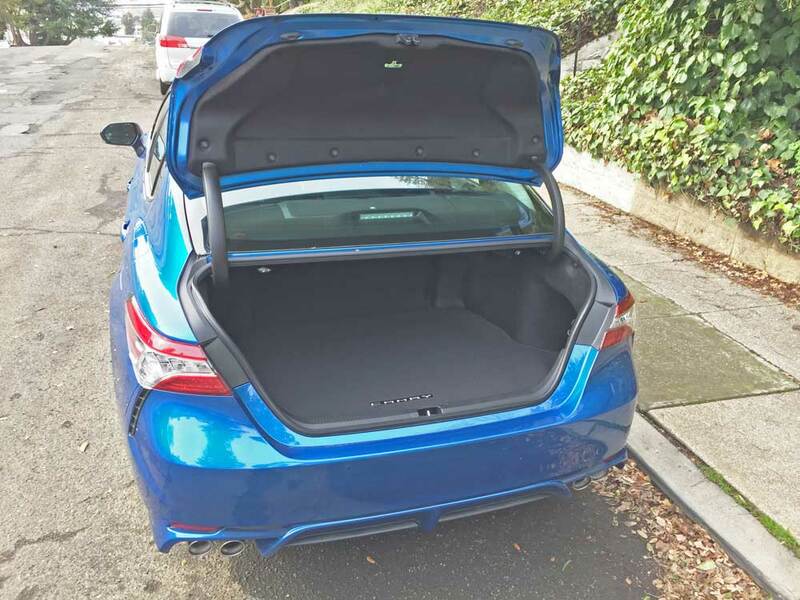 It came with a Blue Streak metallic body and Black Top and a black interior with patterned cloth seating surfaces. The base price was set at $34,600., while options and the delivery, processing and handling fee bumped the final count and amount to $38,874. 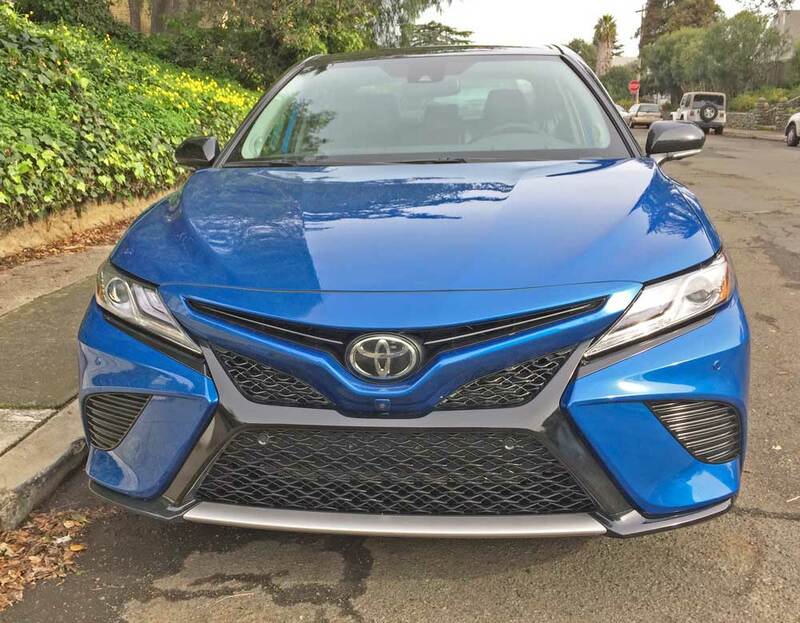 In terms of styling the 2019 Toyota Camry appears much like last year’s model model, with no real significant changes. In seeking to broaden the visual appeal of the new Camry, the development team aimed for a styling and design concept that would achieve a strong harmony between refinement and a sensual athletic image resulting in a bold signature design language. It takes the car to a more desirable direction. In penning the Camry’s design, there were three primary goals: a distinctive, low center of gravity that resulted in a firm wide stance; a practical-yet-emotionally styled cabin profile, and a sporty and upscale image both inside and out. Up front, the new Camry’s face is accentuated by a two-piece grille comprised of flowing thin and thick treatments – key elements of the Camry’s “Keen Look” design philosophy. The Camry’s profile is more aerodynamic with striking character lines around and along the body emphasizing the aggressive front and rear fenders, and giving the car a sporty aura that it never had before. Aft, an athletic motif melds flowing lines and complex shapes displaying a sculpted form. A distinctive crease extends from the slim multicolor taillights down to the bumper, effectively “pushing” the wheels outward, creating a wide athletic stance akin to that of a premium sports sedan. Power continues to be supplied by Gasoline and Hybrid powertrains that produce more horsepower and higher EPA estimated fuel economy ratings. There are two gasoline versions; a 2.5-liter inline four cylinder that produces 203 or 206 horsepower at 6,600 rpm along with 184 or 186 lb.-ft. of torque at 5,000 rpm depending upon the trim level; and a 3.5-liter V-6 that delivers 301 horses at 6,600 rpm while also generating 267 lb.-ft. of torque at 4,700 rpm. The engines are front mounted in a transverse orientation, driving the front wheels, geared through a Direct Shift 8-speed ECT-I automatic transmission with sequential shift mode. Entering the cabin, the interior displays a blend of functionality, futuristic styling, and a high degree of personal space and craftsmanship. Drivers are placed in a sporty cockpit-type environment, with gauges angled toward them, while the front passenger enjoys a sense of openness. Toyota’s latest in-vehicle information technology consists of state of the art displays, providing a heightened level of integrated information with minimal distraction by relaying information through three available interlinked displays. Convenient operation is assured through customizable features and smart phone-like touch screen icons that create a connection and user workflow between the in-vehicle information technology and other digital media. 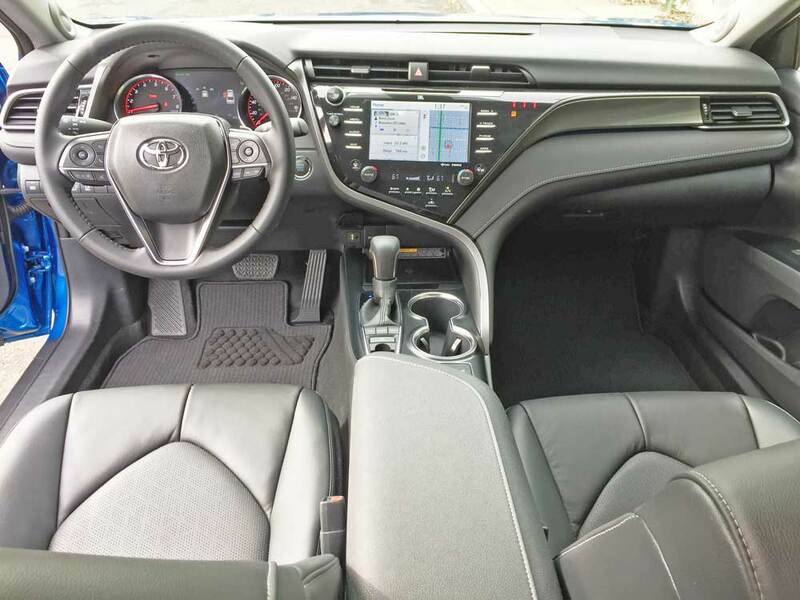 Safety and convenience features abound with: Toyota’s Safety Sense package that includes Pre-Collision System with Pedestrian Detection, Full-speed Range Dynamic Radar Cruise Control System, Lane Departure Alert with Steering Assist, Automatic High Beam; available Blind Spot Monitor with Rear Cross Traffic Alert and Intelligent Clearance Sonar with Rear Cross Traffic Braking; and available Bird’s Eye View Camera with Perimeter Scan. 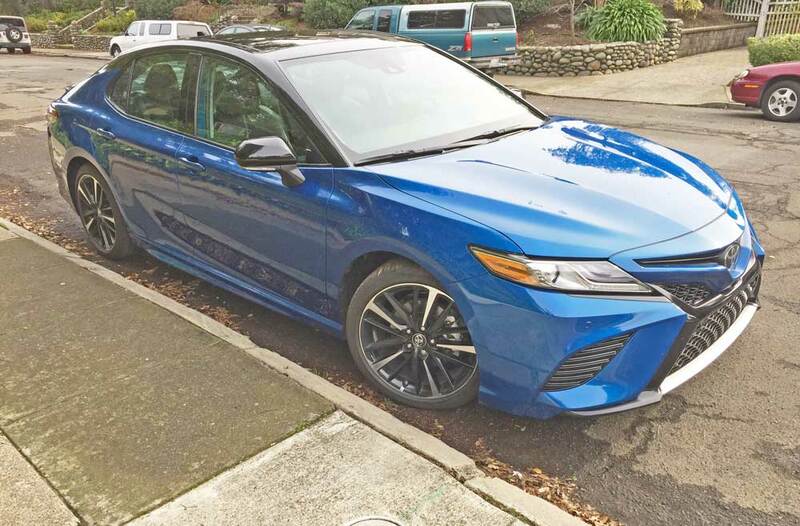 Driving scenarios for my test 2019 Camry XSE V-6 consisted of freeways and beautiful twisting wine country back roads. The ride quality was comfortable, yet planted and stable with excellent road-holding and handling characteristics. The 3.5-liter not surprisingly, delivers the sportiest all around performance, while the 4-cylinder proves to be adequate. 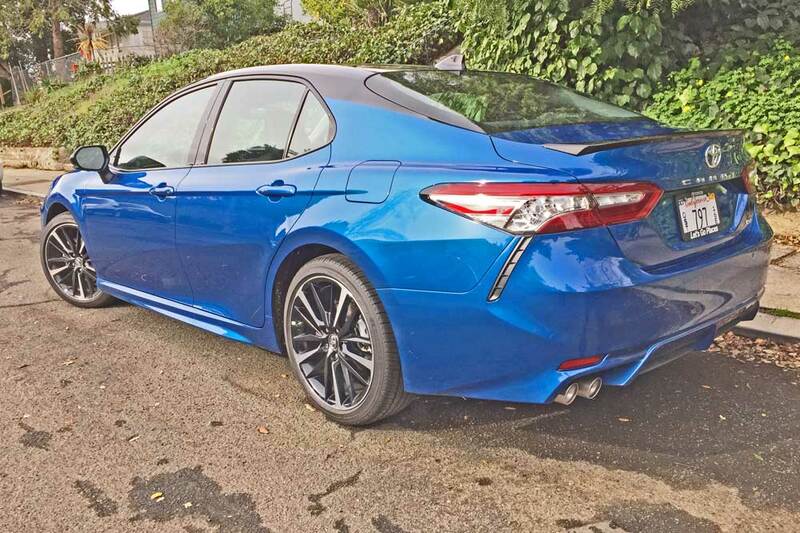 Is the 2019 Toyota Camry the best ever? You bet it is – not only in the eye-candy department, but in terms of driving dynamics and enhanced technological features. It is one of the best all-around cars in its class. 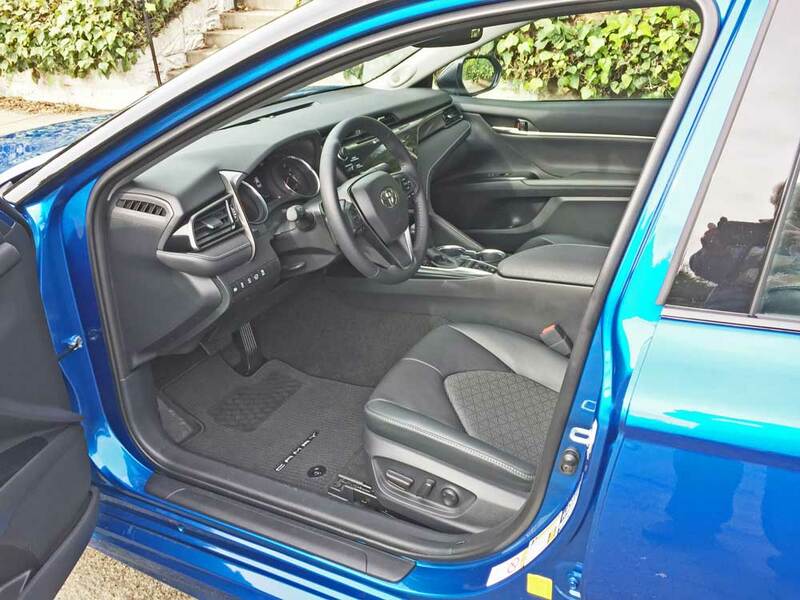 It’s pleasant to drive, provides good fuel economy, and is full of technological features. The infotainment system is user-friendly and delivers an impressive suite of driver assistance programs, and Apple CarPlay is now standard. Engine Type and Size: 3.5-liter, DOHC, 24-valve V6 with dual VVT-i and TDI. Transmission: Direct Shift 8-speed ECT-I automatic with sequential shift mode. Suspension: Front – Independent MacPherson strut suspension with 24.2 mm tubular stabilizer bar and front strut tower bracing. Rear – Multi-link with 25.0 mm tubular stabilizer bar. 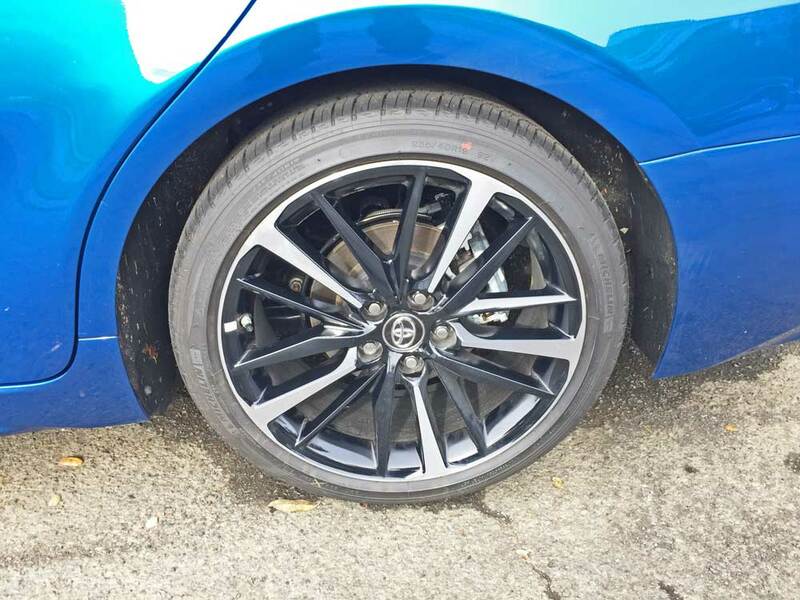 Brakes: Power-assisted four-wheel discs (vented front) with ABS. Tires: Michelin Primacy MXM4 P235/40 R19- 92V mounted on 5-Black “V”- spoke 5 Silver painted spoke alloy wheels..